A part of my Let’s Read “Stars without Number” series. Go grab your free copy of SWN and join in. While the introduction to the Systems section reiterates the dangers of combat; And nowhere does SWN better highlight the dangers than the injury, death, and healing subsection. Yes. Its dangerous, and thank you again for reiterating. You roll 1d6 for your starting hit points. PCs should be very certain that the odds are in their favor before they reach for their laser pistols, and even then, the gods of battle can be cruel. We roll a d8 + Dex for initiative and don’t re-roll at the end of the round. Most [of the time] PCs are not subject to surprise unless their guard is genuinely down at the moment of the ambush or attack. SWN assumes that the characters are cautious. And only sudden and very unexpected attacks could even trigger an ambush. That’s some good news for players. Easy movement is 10 meters; climbing, swimming, rough terrain halves that. You can’t split move between your main action. “On turn” actions involve dropping an item, falling prone, speaking, drawing a Readied item, etc. To hit: Roll d20 + your base attack bonus + skill rank + ability modifier + circumstance modifiers. Untrained counts as -2 for skill rank. Damage: Roll damage die plus relevant attribute modifier. Shock: Some melee weapons do damage on a miss to those in insufficient armor; Add your relevant attribute modifier to that shock damage. Neat. Melee combat is dangerous, and shock ensures sword fights don’t last too long. I like that it reiterates that HP reflects bumps and bruises until you get to those last HP, which reflect real damage. Make a Snap Attack [Instant] - if you haven’t went you can interrupt and make a Melee or Ranged attack at -4. Hold an Action [Move] - Spend your move action to prepare to inject a main action later in the round before some other action. From the list of actions there is a lot of tactical decisions. If you are a melee fighter, get up there and get in their business. You are a serious threat. Should you as a player make a snap action? If you’re a pistol wielder being charged by a monoblade, a snap shot is just as good as firing into melee. So take it. Is someone disengaging form you as a melee master? Take a snap action to lay into them before they flee. And if you’re a warrior, and have yet to use your auto-hit, snap with impunity; The best defense is a good offense. Stars without Numbers advises that GMs not use snap actions for most NPC. The second considerations is transitioning from Stowed to Readied. Don’t yet know what all can be Readied, but it appears that you’ll want those go to items to be Readied - pistol, ammunition, and knife. Forcing Enemy Movement - hit with Punch (or Stab), deal no damage, then win at Punch (or Stab) or Exert. If you win move them 3 meters. Disarming a Foe - make an attack roll, deal no damage, then make weapon based skill check with the weapons used. The defender gets a +3 bonus. If attacker wins by 3 they get the weapon, otherwise it skitters 1d4 meters away. Execution Attacks - Spend a minute not drawing attention to yourself, don’t take any obvious action, then you can skip to hit and armor class, and instead roll a combat skill check (6 for point blank, 8 for normal, 10 for extreme); If you hit, it does max damage and must make a Physical save or be mortally wounded. PCs are vulnerable to this. Two-Weapon Fighting - You must have Skill level 1; take a -1 to hit and do +2 to damage. Do not add the second weapons Shock bonus. The execution attacks are the biggest surprise. I’m fine with PCs setting up for an execution attack; It would likely require a series of checks to get into place. I’d have to think about executing a PC. If an NPC drops to 0 hit points, its GM’s discretion. If a PC drops to 0 hit points, they have 6 rounds to live. For a PC at 0 hit points, someone will need to take a Main Action to stabilize them - with Int/Heal or Dex/Heal. Use of the biopsionic technique Psychic Succor automatically stabilizes. Increase the base DC by the number of rounds since they went down. Without tools this is a rather grim prospect. Ten minutes after someone stabilizes you you wake up and regain 1 HP. From that point, until you get bed rest, any damage you take kills you outright. Treatment from advanced pharmaceutical stims or Biopsionic techniques avoids this fragility. The recovery system bakes in recovery times based on tech level treatment available. Lower tech levels results in slower recovery, and at TL 2 or less recovery is not guaranteed. If you plan to enter into combat, make sure you have a biopsion available, otherwise recovery is 1 HP per level per day of rest in a TL 4 medical care center. 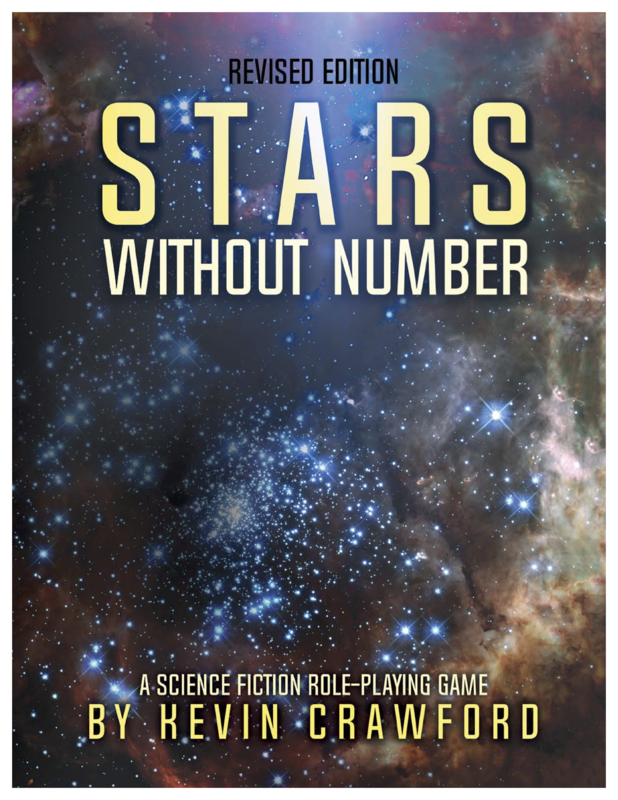 Stars without Number combat shows the basic bones of B/X D&D with updates and clarifications drawn from the 3.X D&D lineage. The Shock and Snap Attack aspects of combat intrigue me and are something I look forward to seeing in play. If you plan to get into combat, make sure you have a friend trained in Heal or Biopsionics. You’ll also want to have access to three lazarus patches; And have at least one of those Readied (so as to not spend an action retrieving them and raising the difficulty of the skill check). Let's Read “Stars without Number” - Combat and Healing by Jeremy Friesen is licensed under a Creative Commons Attribution-NonCommercial-NoDerivatives 4.0 International License. Based on a work at https://takeonrules.com/2018/07/11/lets-read-stars-without-number-combat-and-healing/. Permissions beyond the scope of this license may be available at https://takeonrules.com/more_permissions/.